This timely volume represents one of the first comprehensive, student-oriented guides to the under-published field of early modern women's writing. 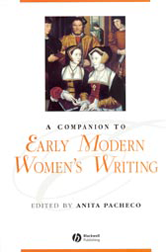 Brings together leading international scholars to provide the definitive survey volume to the field of early modern women's writing. Examines individual texts, including works by Mary Sidney, Margaret Cavendish and Aphra Behn. Explores the historical context and generic diversity of early modern women's writing, as well as the theoretical issues that underpin its study. Provides a clear sense of the full extent of women's contributions to early modern literary culture.